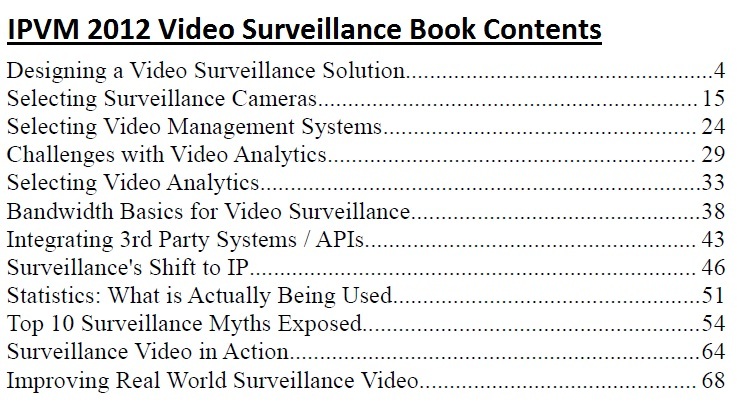 We are proud to release a NEW, FREE, video surveillance book available now. This replaces our original 2008 book which was downloaded over 30,000 times, educating professionals around the globe. This book, far better and more insightful, takes it to the next level. This new 2012 version incorporates our world leading research and test results over the past 3 years, enabling us to provide far greater depth and breadth of coverage in the book. While the original one shed light on important issues, this new version explains them in a much deeper manner. This book is ideal for anyone who knows a little about surveillance but wants to understand the key issues and challenges in using real world systems. Ensure a free, non vendor resource is widely available that helps the community learn about critical issues. Make it easier for those wanting to get started with professional surveillance systems. Introduce our world leading research and PRO member service to new people. It's free. All you need to do is click on this link to request the book. If you are not a member, just submit your email and a copy will be emailed to you. If you are a member and logged in, you can download the book immediately. If you have any feedback or questions, let us know in the comments.